Genuine artistic growth or a cheap ploy to adhere to popular culture's latest trend in music? "She also said that she'd been waiting for someone to write with and fill exactly what she was looking for in terms of production and the beat. And then once you add Jimmy and Sam to the equation to write melodies and songs, it's like a power team. It's just good timing as well. She's just ready to do it. ... She doesn't need to do this. She wants to and it's great." 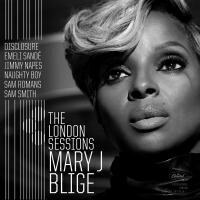 This monologue comes at the end of "When You're Gone", the fourth track from Mary J. Blige's The London Sessions. Other snippets of dialogue are spliced between various songs throughout the record, though none of them seem to strike as much of a chord as the one at hand. Phrases like "good timing" or "she doesn't need to do it" ring so true, in fact, that you could probably hear the sound of the bell chiming on either side of the Atlantic. Sure, that voice isn't wrong when it says that the timing is right for an established R&B star to make a grand statement smothered in house and EDM and garage influences (all the genres all the cool kids adore these days). But as for the latter part of that statement? Holy moly, it's undeniable: Mary J. Blige really did not need to do this record. The London Sessions feels cheap. Actually, it feels like the sound of a star who once stood at the top of her class and now wants to figure out how to regain her Prom Queen crown as she approaches her 40th birthday. What do you do when your records stop selling (you do know she wrote the soundtrack to How to Think Like a Man Too, right?) and your status among your genre's elite is questioned? You call up buzzy, cred-laden names like Disclosure, book a room in London for six months, and watch as the world comes flying back into your light's orbit, much like moths do when they try to devour a hanging lantern. More forgiving minds might view it as a way to evolve with changing times and praise the singer for stepping out of her comfort zone, all in the name of embracing growth. Others have a listen to songs like "Right Now" and "My Loving" and wonder why the hell someone like Mary J. Blige would want to rewrite the Night at the Roxbury soundtrack. Unironically. With Sam Smith. Actually, to be fair, the diamond in the rough here comes from the record's lead track, "Therapy", which Smith helped write. It's the most interesting Blige has been in years, the song's doo-wop feel creating a wave of promise that is never heard from again within the fabric of its 11 brothers and sisters. What's often been lost in the singer's blend of R&B pop through the years is her ability to turn that sultry baritone into a weapon in the context of a throwback sound and yesteryear ideals. "Therapy" provides that opportunity and it works with irresistible effect. Three or four more of these, and the set as a whole could rank among Blige's best. Instead, what comes is a trip through fad-obsessed miscalculations and weirdly low-rate song-craft. "When You're Gone" works great for a late-night radio show hosted by Delilah, its acoustic guitar serving as cat nip for adult contemporary die-hards, but does it work for the voice that once took home a Grammy for the great "He Think I Don't Know"? Come on, now. "My Loving", meanwhile, suggests it might have served as an impetus of Blige's foray into the house world, if only because it feels like the laziest and most incomplete of the bunch. Even when the singer seems locked in, the Euro-disco moments don't entirely rise up to the potential that's there. "Right Now", the Disclosure collaboration, suffers for its lack of climax. Building and building over a stuttering back-beat, the hook doesn't open up into the euphoria everybody already knows the EDM duo is capable of bringing otherwise. "Nobody But You" then sounds like Cher's latter days had a baby with the more embarrassing sides of J-Lo's pop persona. It's just empty, a clear attempt at getting a spot on some playlist in Ibiza more than it a play for actual song-writing that even remotely touches on soul music. It's no surprise, then, that the record's bearable moments are the ones that at least use a couple dashes of traditional R&B flavors. "Doubt" is one of only a couple tracks here that seems like it might actually be found on a prior Mary J. release, the contemporary gospel tendencies and pretty backing harmonies making way for her recipe of rhythm. And album-ender "Worth My Time" harkens back to how emotive things can sound when the singer sits alone with a piano ... and that piano isn't tuned to Life in the Key of John Tesh, mind you. She's always been at her best when you know she means what she's singing more than she might even want to. "Worth My Time" doesn't quite get there, but it's closer than anything else around it. Which, ultimately, is why The London Sessions doesn't work: You can grow all you want as an artist, but in order to maintain relevancy, you have to consistently find ways to remind people of who you are. Too often does this Mary J. Blige record not actually feel like a Mary J. Blige record, and compounding that fundamental issue is the mere reality that so many of these songs piggyback the hottest genre of music in the world right now. It's not that she doesn't still have that voice here, but it's fair to say that The London Sessions probably doesn't have that attitude. And Mary J. Blige without her attitude is kind of like Michael Jordan picking up a catcher's mitt. So, yeah. It might be good timing for her to put something like this together in a world where festivals dedicated to this kind of music exceed the hundreds of thousands in attendance and you can't swing a cat through Top 40 radio without hitting at least a couple dozen EDM/house/garage-influenced songs. But when you've built a career off being one of the realest, most painfully painful singers and songwriters in the business, it's worth saying this one more time, just to make sure it's not ignored: She didn't need to do this. She really, really didn't need to do this.